Everyone has a gag reflex, a protective mechanism that prevents foreign objects from entering your throat and airway. Some people have an exaggerated gag reflex that can make receiving dental treatment difficult or even impossible. Dentists can employ certain treatment strategies to help you receive the dental care you need despite your problem. What Causes an Exaggerated Gag Reflex? The reasons behind your sensitive gag reflex may be psychological, physiological or both. For instance, you may have had a traumatic past experience where you were nearly suffocated. Receiving dental treatment subconsciously reminds you of that experience. Gagging can also be induced simply by anxiety, fear and apprehension involved with being at the dentist. Communicate your fears: Dental health is vital to your overall well-being, so don’t let your active gag reflex keep you from setting a dentist appointment. When you choose Evanson DDS, tell us about your problem, any fears you have, and specific dental work that has caused you to gag in the past. We can work with you to help make your experience at our office as pleasant as possible. Breathe through your nose: Take deep breaths to help you stay relaxed and not become overwhelmed. If you have a stuffy nose on the day of your appointment, consider rescheduling. To help ensure you can breathe without incident, take a nasal decongestant prior to your appointment. Use numbing throat spray: Over-the-counter numbing throat spray can temporarily relieve the gag reflex. Use two or three sprays immediately before treatment and the numbing should last about an hour. Use snore relief spray: Subduing the gag reflex is the not the original intent of snore relief spray, but most patients respond well to this remedy. Use it right before your dentist appointment to help make your appointment more pleasant. Place salt on your tongue: Another trick to tackle physiologically caused gagging is to place a dab of table salt on your tongue. You can also choose to swish with salt water. Just remember to spit out the water, not swallow it. Hum: When the dentist places a tool in your mouth, start humming. You’ll be surprised to learn you can’t hum and gag at the same time. Pick a good time of day: You may find you are more susceptible to gagging at certain times of day. If you gag more when brushing your teeth in the morning than at night, scheduling your appointment later in the day could be worthwhile. Sit up rather than lying down: It may require some unconventional measures, but it’s possible for the dentist to take impressions and perform other work while you’re standing, which can help subdue the gag reflex compared to lying down. 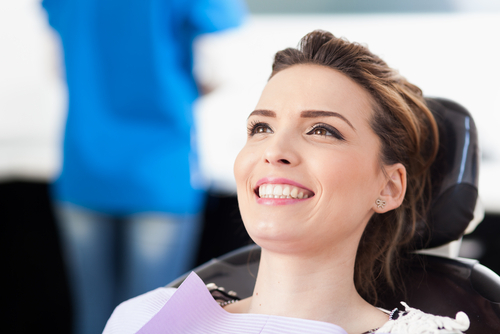 Use some form of sedation: Nitrous oxide (laughing gas), oral sedation and IV sedation are three options that allow the dentist to perform quality work without any discomfort on your part. Practice getting control over your gag reflex: Each night after brushing your teeth, gently touch the toothbrush to the soft palate at the back of your mouth. You’ll feel the urge to gag, but you can control it by concentrating on breathing through your nose. As you become less sensitive week by week, advance the toothbrush a little further back. This tactic works, but you must be willing to put in the practice. Evanson DDS is well equipped to treat your dental problems despite your exaggerated gag reflex. Please contact us online or call (720) 409-0008 to discuss your concerns and schedule an appointment at your convenience.